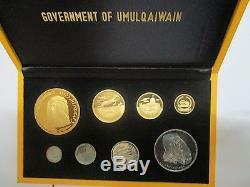 1970 (AH 1389) Umm Al Qaiwain (UAQ) United Arab Emirates (UAE) Gold And Silver Coins Proof Set. Contents: 1, 2, 5, 10, 25, 50, 100 & 200 Riyals. 200 Riyals Serial No: 20. 10 Riyals Serial No: 150. Weight: 3.0000 g (0.0964 oz). 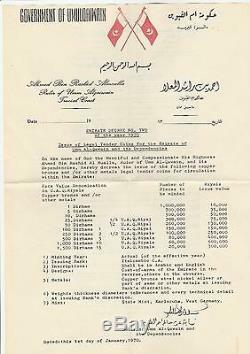 Ruler: Ahmad bin Rashid al-Mualla. Obv: Dates within crossed flags, sprigs within circle. Rev: Old cannon within wreath. Weight: 6.0000 g (0.1929 oz). Obv: Dates within crossed flags, sprigs at left and right within circle. Rev: Fort of the 19th Century. Weight: 15.0000 g (0.4822 oz). Weight: 30.0000 g (0.9645 oz). Rev: Facade of the great Rock Temple. Weight: 5.1800 g (0.1499 oz). Weight: 10.3600 g (0.2998 oz). Weight: 20.7300 g (0.5998 oz). Weight: 41.4600 g (1.1996 oz). Rev: Head of Sheik Ahmed bin Rashid al-Mualla left. The item "1970 Umm Al Qaiwain UAQ United Arab Emirates UAE Gold And Silver Coins Proof Set" is in sale since Tuesday, May 10, 2016. 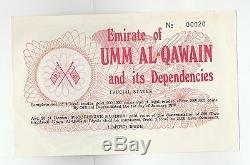 This item is in the category "Coins & Paper Money\Coins\ World\Middle East\United Arab Emirates". 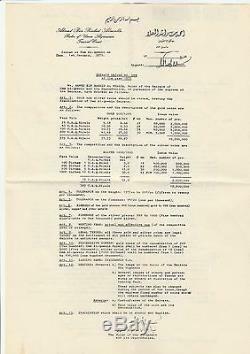 The seller is "sandeepsabir1" and is located in Abu Dhabi, Abu Dhabi. This item can be shipped worldwide.